A few months ago, I talked about TaroVR, a mysterious product for capturing spherical 360 photos. They had approached me about their prototype product. At that time, the concept was to create a smartphone gimbal that could automatically rotate the phone to take detailed fully spherical 360 photos. It looked promising, but I couldn’t tell you about it except to ask you guys to watch for it. The change in concept was the reason for the delays. It appears that the change was a good call — Taro AI has been successfully funded on Kickstarter after just two days. Little wonder because it provides a much more affordable alternative to SoloShot, which is also a camera with auto tracking capabilities. 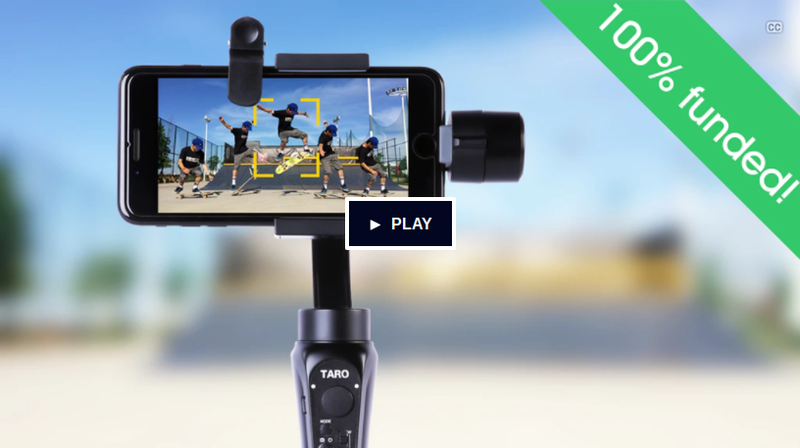 Taro is working with gimbal manufacturer Zhiyun to create the gimbals. In addition to auto-tracking gimbals, you can purchase the M1 tracking module by itself, which can be used to attach to your existing gimbal to give it auto-tracking capabilities. Please understand that crowdfunding is not the same as buying from a store or preordering a product. It is more like you are lending them money with the hope that they will repay you with their product. There are usually delays, and in the worst case scenario, you might not get the product at all, with no remedy. As for the spherical capture, they plan to launch it in April or May 2018. Hello Mic, I first thought it looked a lot like the Osmo Mobile, but now I’m pretty sure it’s actually the Zhiyun Smooth-Q with a Taro label slapped on. This would also explain the tracking comparison on the Taro website because the Zhiyun software is inferior to the DJI product. If the gimbal is not really their design I’m suspicious about the snap bracelet for tracking (which is interesting in theory). It’s good you warned about the Kickstarter risks, but I think the other products could certainly be mentioned. I own the Osmo Mobile myself, but I’m playing with the Insta360 ONE right now which also supports tracking. Perhaps I should compare the tracking of both!